Offering you a complete choice of products which include acid pump, chemical process pumps, hot water pump, ss pump, ss pumps and hcl pump. Leveraging on our vast industry experience, we are offering our clients a finest quality range of SS Centrifugal Pumps. These pumps are manufactured by our professionals using excellent quality SS 316 and other material in compliance with international quality standards. 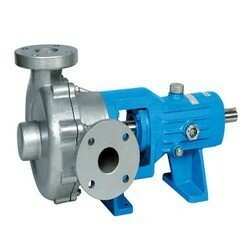 The offered pumps are available in various technical specifications as per the need of our clients. These pumps are widely used for chemical transfer from underground to overhead tank,unloading from tanker, washing and cleaning of parts, food and dairy products, beverages, etc. Further, these SS Centrifugal Pumps are widley used in sugar, paper, chemical, petrochemicals, refinery, and other industries. SS Centrifugal Pumps Complete SS 316 Horizontal centrifugal pumps with High head, High discharge design. Hydraulically balance impeller gives better economy and lower power consumption. Sealing arrangement by Carbon v/s Ceramic Mech. Seal, which compatible with almost all liquids. Special seal or gland packing can be supplied on request. Ideally suitable for chemical transfer from underground to overhead tank, unloading from tanker, washing and cleaning of parts, Food and dairy products, beverages etc. Clients can avail from us Chemical Process Pumps at market leading prices. Manufactured using the optimum quality raw material, this product is widely demanded in various industries and is appreciated for its compact design, corrosion resistance, and excellent performance. They are made available to our clients at very reasonable rates and within the specified time frame. Head Up to 60 Mtr. SS Pump Ours is a reputed firm, engaged as manufacturer, supplier and exporting optimum quality S.S. Pump. Our monoblock pump is thoroughly inspected by our quality controllers so as to assure its high performance and usefulness. Owing to its high operating efficiency and vibration & noise free operation, our pumps are highly demanded in the market. Available in various capacities and specifications, our S.S. Pump is widely being used in irrigation sector, air conditioning systems, water supply systems and chemical industries. •Head : Up to 60 Mtr. •M.O.C. : CI, CS, SS-304, SS-316, Bronze etc. 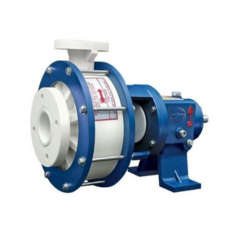 SSP Series pumps are Self Priming pumps which are ideal for use in barrel unloading, tanker unloading, Chemical transfer from sump to overhead tank and many process application. All parts are made from Graded SS 316 investment casting which gives better quality, surface finish and longer life. Precision manufacturing with precise tolerance enables pump to deliver high capacity and head. SSP series pumps can also be used for boiler descaling, pressure boosting, water recirculation, beverages, petrol , kerosene and diesel etc. Shaft sealing is done by Mechanical seal which is available in Carbon, Ceramic and Silicon as per the requirement. Clients can avail from us Chemical Process Pumpsat market leading prices. Manufactured using the optimum quality raw material, this product is widely demanded in various industries and is appreciated for its compact design, corrosion resistance, and excellent performance. They are made available to our clients at very reasonable rates and within the specified time frame. SS Horizontal Centrifugal Pumps with High head, High discharge design. Hydraulically balance impeller gives better economy and lower power consumption. Sealing arrangement by Carbon v/s Ceramic Mech. Seal, which compatible with almost all liquids. Special seal or gland packing can be supplied on request. Ideally suitable for chemical transfer from underground to overhead tank, unloading from tanker, washing and cleaning of parts, Food and dairy products, beverages etc. Leveraging on our vast industry experience, we are offering our clients a finest quality range of SS Centrifugal Pumps. These pumps are manufactured by our professionals using excellent quality SS 316 and other material in compliance with international quality standards. 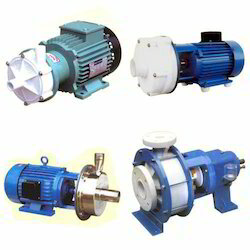 The offered pumps are available in various technical specifications as per the need of our clients. 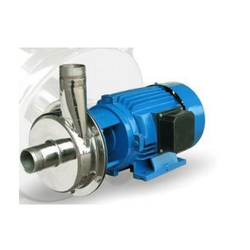 These pumps are widely used for chemical transfer from underground to overhead tank,unloading from tanker, washing and cleaning of parts, food and dairy products, beverages, etc. Further, these SS Centrifugal Pumps are widley used in sugar, paper, chemical, petrochemicals, refinery, and other industries.